So what have I been up to in my absence? 1. Working on the extremely collectible Kittenwar line of products, AVAILABLE NOW TO PRE-ORDER FROM AMAZON UK or from AMAZON US, even though they’re not out until the second half of 2007. 2. Visiting Luxembourg. It’s breath-takingly pretty, yet irredeemably dull. Quite a mixture. 3. Eating testicles. Not in a sexual sense, of course, but in the Lebanese restaurant kind of way. Creamy, delicious, and highly recommended. 4. Recording voice-overs that are subsequently badly lip-synced to footage of Neil Ruddock. Don’t ask. 5. Painting my bathroom day-glo green. Anyway. On with the show. 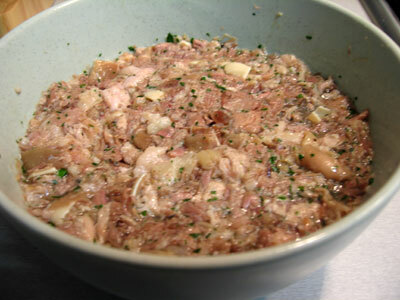 Upon moving into my new flat last month I decided I needed to set myself a culinary task, something to set the standard for all subsequent cooking projects, and settled on the delightfully-named head cheese (more commonly known in the UK as brawn, as tête fromag&#233e to the French, or as queijo de porco in the favellas of Rio de Janeiro). 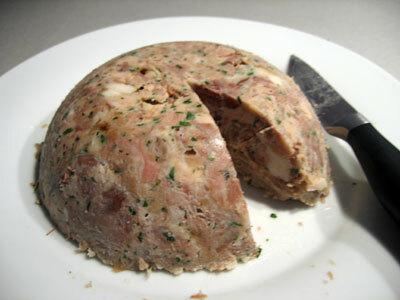 For the uninitiated, head cheese is a cold-meat jelly constructed from the head of a pig. A staple part of the British diet during the middle part of the last century, it’s popularity has waned of late. I can’t imagine why. Getting hold of a pig’s head is itself an adventure, entailing an early morning trip to bustling environs of Borough Market, where smug country-dwellers sell delicious yet over-priced provisions to London’s middle-class households. Eventually I procure my porky noggin from the fine butchers representing Northfield Farm, who quarter the cranium according to my instructions (my cutlery drawer lacks a bone saw), much to the bewilderment/horror of a steadily growing crowd of camera-wielding tourists. On arriving home I unpack my porcine parcel and begin the delicate task of cleaning the beast. 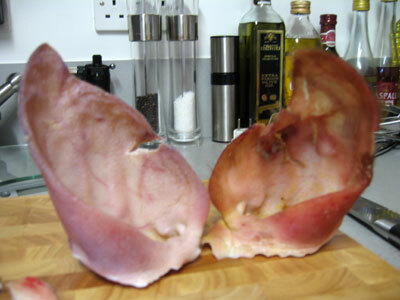 First up, the ears. These are severed from the skull, cleared of all bristles and washed. The image below demonstrates the before (right) and after (left) stages in this process. 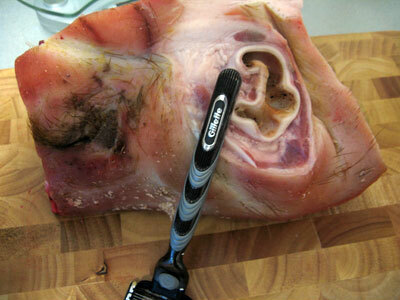 All other parts of the head are then shaved, before proceeding with what must be the least pleasant part of the project, picking earwax from the pig’s auditory canal. Suffice to say, our porker wasn’t the most hygienic of critters, and a hefty residue of aural marmalade has to be mined before being able to progress with the recipe. Gillette. The best a pig can get. Of course, we’re relying on our good friend Hugh Furry Whittingstall to provide instruction and, as ever, he provides. 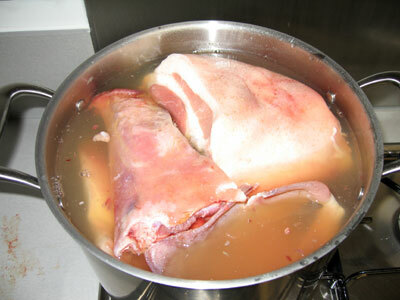 First up, we soak the pieces of meat and bone (as well as a couple of trotters) in brine for 24 hours. I use Hugh’s standard brine with the additional of a couple of litres of apple juice. Brining over, it’s time to cook. Various herbs (parsley, bay leaves, thyme and marjoram) and spices (peppercorns, cloves, coriander seeds) are tossed into the pot alongside the brined meat and trotters, and a couple of onions. 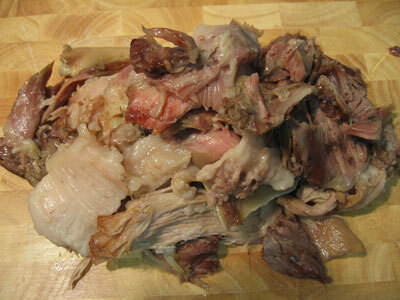 After four hours of gentle simmer, the meat can easily be pulled from the bone. I chop the meat, mix with a handful of parsley and some lemon juice, then combine with a few tablespoons of the cooking liquor, which I’ve strained through a piece of muslin (available from the drapery department of the very fine John Lewis department store). 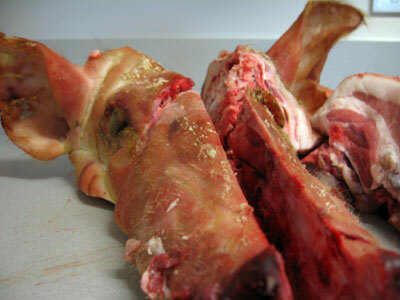 This heady blend, rich with gelatin from from the trotters, is put in a dish and refrigerated overnight. By morning, it’s ready. Turned out and sliced, it’s delicious: nuggets of creamy white fat nestling gleefully next to chunks of snout, cheek and eyelid, all combining to create bite-sized bursts of ambrosial brilliance. Special meaty bonus: As I enjoyed the end result so much, I’ve decided to make the image above available as a computer wallpaper. Simply download using the links below, making sure you choose the correct resolution image for your machine. * I didn’t actually know this, I just copied it from Wikipedia.